This new piece is inspired by the success of the original silver star necklace that is now my best selling piece of meteorite jewellery. This is a larger star than that, and set with a smaller star with a fragment of Campo Del Cielo iron meteorite in the centre. 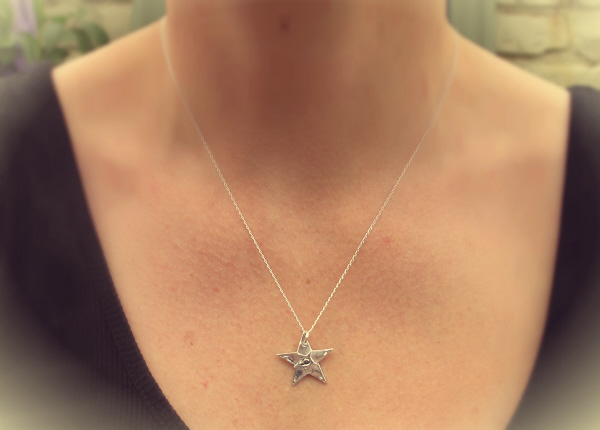 The full star measures 2.1cm across and is strung from an 18 inch sterling silver curb chain. I think this would look very elegant and intriguing around ANYONES neck. Would suit a man or lady. Boxed in a high quality jewellery box along with a signed certificate of authenticity.